Table Setting of the Week #16: Think Pink! October is Breast Cancer Awareness Month. So with that in mind Melissa put together a pink accented table setting that is is neither saccharine nor juvenile. By using the pink as an accent, not only does the setting highlight the pink items, but brings out the complementing blue of the Heaths Ceramics Coupe dinnerware in moonstone. To achieve this look, start with Modern Twist Drizzle Placemats in magenta. Then place the Heath Ceramics Coupe Dinner Plate, salad plate, and bread plate, all in moonstone. Place the Libeco Home Polylin Blend Napkin in raspberry between the bread plate and the salad plate for added contrast and that hint of pink. iittala Piano Workshop, 5 piece Place Setting and Schott Zwiesel Pure Whiskey and Schott Zwiesel Pure Sauvignon Blanc completes the place setting. The Schott Zwiesel Pure Whiskey does double duty as a water glass and an after dinner apperatif glass. And the Schott Zwiesel Pure Sauvignon Blanc can be used for both white wines and young reds like a beaujolais that doesn't need a lot of aeration in order to enjoy it. The center of the table is Simon Pearce Stowe Bowl with a gorgeous glass swirl work on the exterior that makes the bowl look like a rose when seen from above. 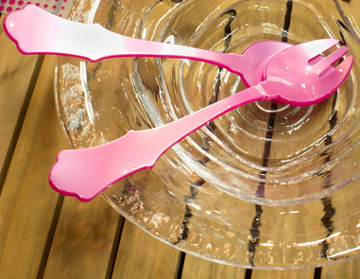 The Sabre Paris Old Fashioned Salad Set in baby pink adds the dramatic and oh so pretty pop of pink. Beside that is Heath Ceramics Medium Covered Serving Bowl in moonstone used to serve, say, braised short ribs using Sabre Paris Natura Serving Set in pink, a stronger pink than the baby pink of the salad servers. This pink is able to hold it's own against the bold moonstone blue of Heath Ceramics Medium Covered Serving Bowl. And finally, for a bit of vertical drama, serve the water in the tall Simon Pearce Barre Pitcher in large. These Fall Cocktails will Warm Things Up!